Slowly but surely I've been adding a little character to my dining room, which includes hanging some drapes. Although I love the look of the curtains, I was left with an awkward space above the sliders. So, I decided to try my hand at creating a rustic 'barn wood' hand painted sign to fill that space and I am sharing the tutorial here today! Although the finished product looks weathered and old, it's deceptively simple to make! I do own a Silhouette cutting machine that can create stencils in vinyl, which can also be used as a template for creating a sign, however, I prefer the simplicity of a hand-painted sign and wanted to offer an alternative for those who don't own a fancy machine! 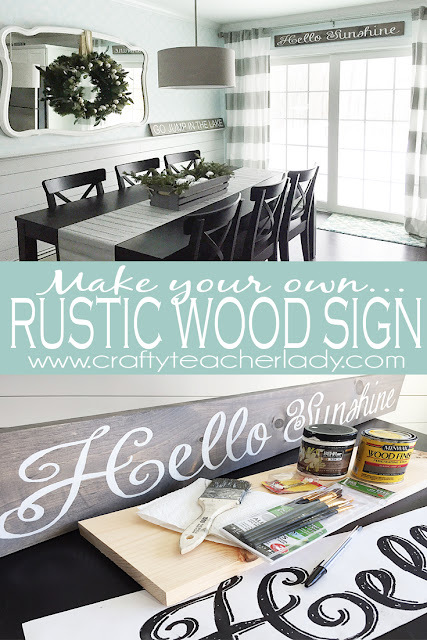 -Pine board: You can use whatever size you want...the kind folks at Home Depot/Lowes will cut a longer board down to the size you want which allows you to get a couple signs out of one board. I purchased an 8'x5.5" board and had them cut it in half to make two 4' signs. 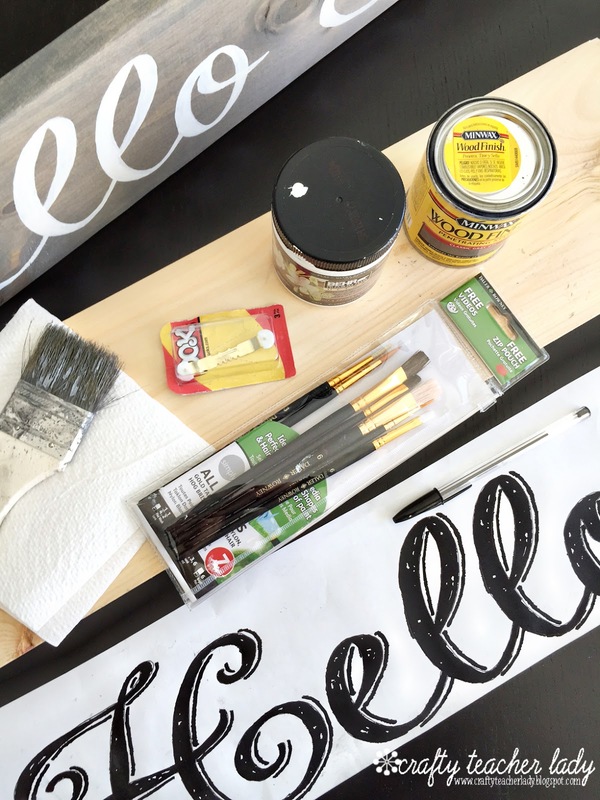 -Paper template: Use any word processing program to print out whatever phrase you'd like to paint on your sign. Depending on the size, you may have to print out your phrase on more than one sheet of paper and tape it together. Prep your board by sanding down the edges and the corners. You can choose to skip this step, however you may find that some of the board edges are rough where they were cut. I like to round my corners for a more 'worn' look. Use the larger paint brush to apply a thin layer of stain. 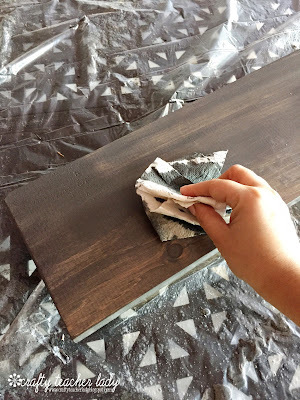 Make sure to stain all four edges and check for drip marks. The longer you leave the stain on the board, the darker the color will be. I used the cloth (just a cut up old cotton t-shirt) to wipe off the stain almost immediately after applying. *You may want to wear gloves and old clothes and should definitely use a drop cloth as the stain tends to make a mess! 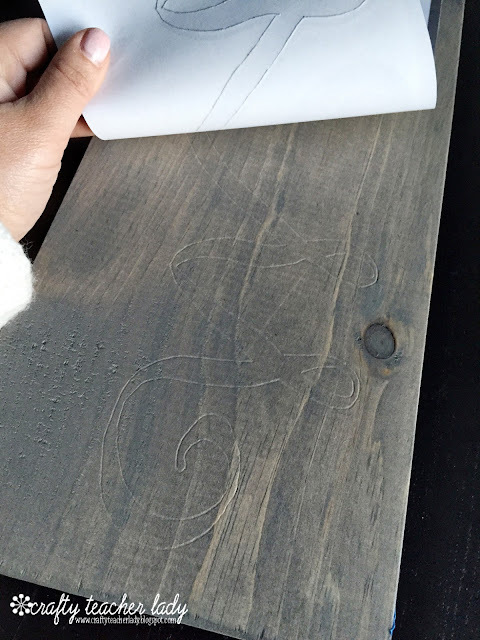 After the stain has had time to dry (usually about 20-30 minutes) you are ready to trace your template. I like to leave about 1" border on all sides of the template and take my time to ensure that my template is evenly spaced on my board. Use painter's tape to secure your paper template onto your board. 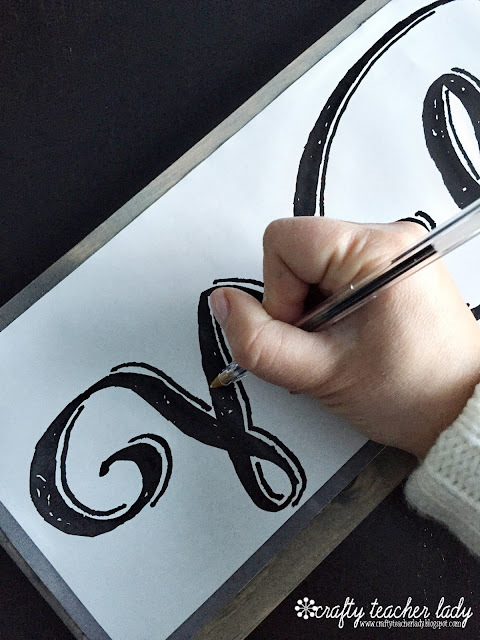 It's time to trace your lettering! 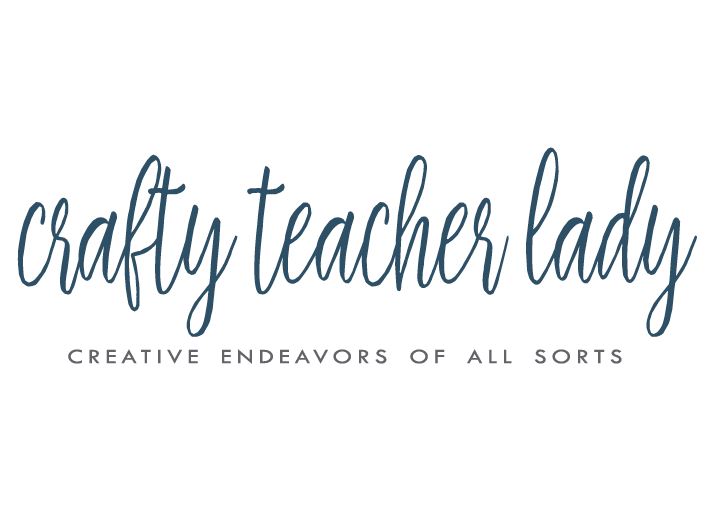 For both templates featured in this tutorial (Hello Sunshine & Welcome) I've used this free font. Using a ball point pen, trace each letter on your template using a fair amount of pressure. The objective is that you are essentially etching your letters into your wood since the pine board is soft enough to make an impression. 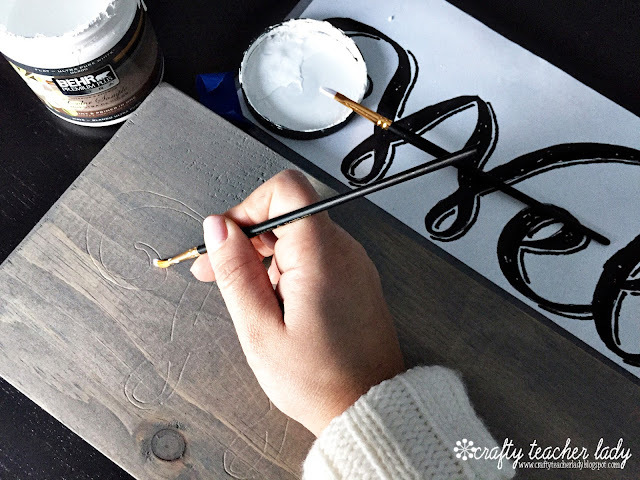 Now that your template has been traced into the wood, use your small craft/art brush and acrylic craft paint (I used a tester sample of flat white Behr paint from Home Depot and it worked great) to carefully start filling in your letters. When it comes to this detail work, less paint is better. 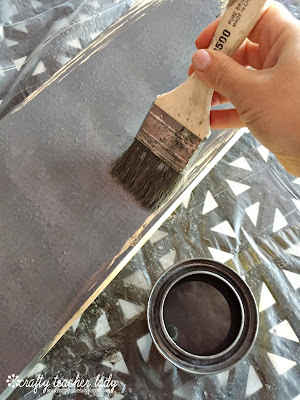 Take your time and be careful not to smudge any areas that you've already painted as your hand moves across your board. It's OK if the lettering doesn't look perfect as we are going for the 'rustic' look and anything hand painted isn't going to be perfect. Also keep in mind that from farther away, slight imperfections won't be noticed! I only painted one coat, but that's really personal preference! 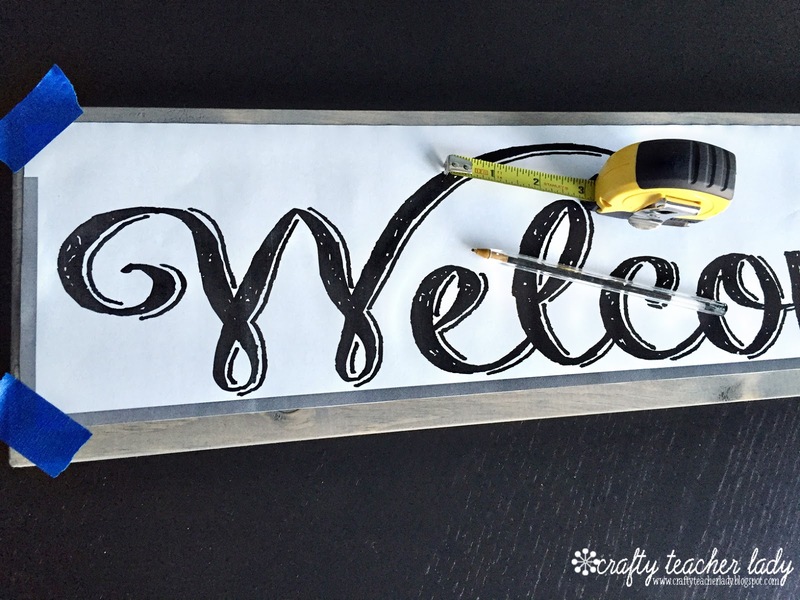 It took me about an hour to trace and paint my smaller 'Welcome' sign. 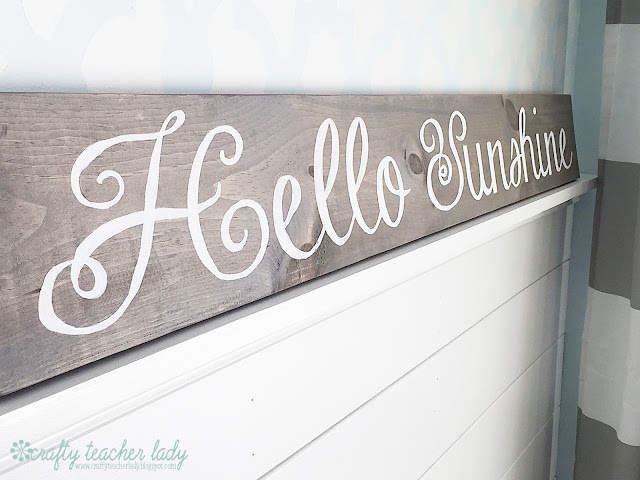 The larger 'Hello Sunshine' sign took me almost 2 hours (but it was the first sign I did and I'm a bit faster now)! 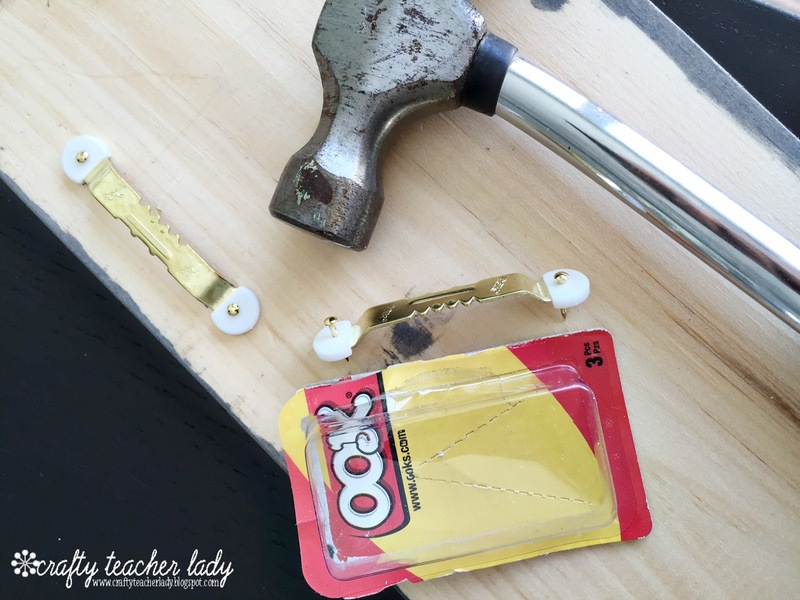 Once your letters are finished drying, secure your saw-tooth hangers to the back for hanging. For my 2' sign, I only used one hanger in the center, but for my 4' sign, I used two, one on either end. I really like Ook brand hangers (not sponsored, just think they are well designed)! Sit back and admire your work! I've since made several of these signs, both for personal home decor and as gifts for family and friends! 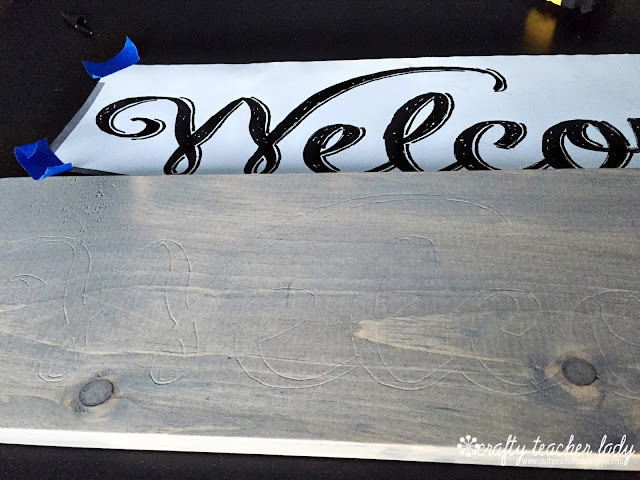 An optional last step would be to take some sand paper and rough up the surface of your board to give your lettering an even more worn/rustic look! I'd love to see your finished products! Find me on Instagram and on Facebook and let me know what you've been up to!